We are right next to Saldanha, in the business center of Lisbon, just a few meters away from the Saldanha metro station (Red Line). We have 350 square meters waiting for you, with fully equipped rooms, designed with your business in mind. We are known for our flexibility and our Cowork space can be used for as long as you need, no strings attached. We also have meeting and training rooms that can also be used for conferences or workshops. You get a 10% discount just for being a Cowork customer. For just 1.5€ per month you can also rent a pack with a keyboard, a mouse and a mousepad. The meeting room hour pack can be used only from 9am to 6pm on weekdays. Whenever we are open on Saturdays (usually 3 per month), Sundays or from 6pm to 10pm, we will let you know in advance. No further cost will be charged in these cases. In the case that you opt for the weekly cowork pricing, the meeting room hour pack and printing pack applicable are 1/4 of the corresponding monthly packs. 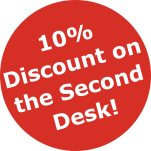 If you sign up for a second cowork desk it will benefit from a 10% discount. All prices are subject to VAT ​(currently 23%).